Back to School Anxiety: How to Curb the Panic | Let’s Dad This. With a high-anxiety and gifted child, back to school can become a real struggle. Overthinking can create a flat-out panic-worthy situation in his mind. Over the past four first-day-of-school routines, we’ve learned a few important “tricks” to ease into the school year and diffuse the tension before it’s too late. This post may contain links to products I think are awesome. If you use one of these links, I’ll earn a small commission. Read more HERE. Any time our kids start to panic about something, we find that talking it out is a key starting point to keeping things within the real world. Their fear-based fantasy world is a bad place to be. Bringing them back to reality is crucial. For the beginning of the school year, we talk about what things are giving them anxiety, what fears they have, and what things they’re excited about. I’d like to say this is an easy step, but it isn’t always that way. In first grade, our son dealt with some major bullying issues that were never fully resolved. When we got close to second grade starting up, things got worse quickly. He had no desire to talk, but he panicked really hard for about a month beforehand. When we finally did get him to talk with us, we eased that anxiety quite a bit. One thing we make known to our kids is that anxiety is a real thing, and that people get anxious about stuff all the time. It’s normal to experience fear at the start of something new, and a new school year is a perfect opportunity for that fear to pop up. Helping them know that they’re not experiencing an emotional unknown allows them to understand that this too shall pass. Sometimes we minimize our kids’ feelings, especially when we see a situation that is blown out of proportion. But we can’t discount those feelings altogether. Fear over a new school year is a big emotion. That anxiety hangs heavy around their necks, and if we aren’t willing to acknowledge that, we may end up letting them drown in the midst of their feelings. 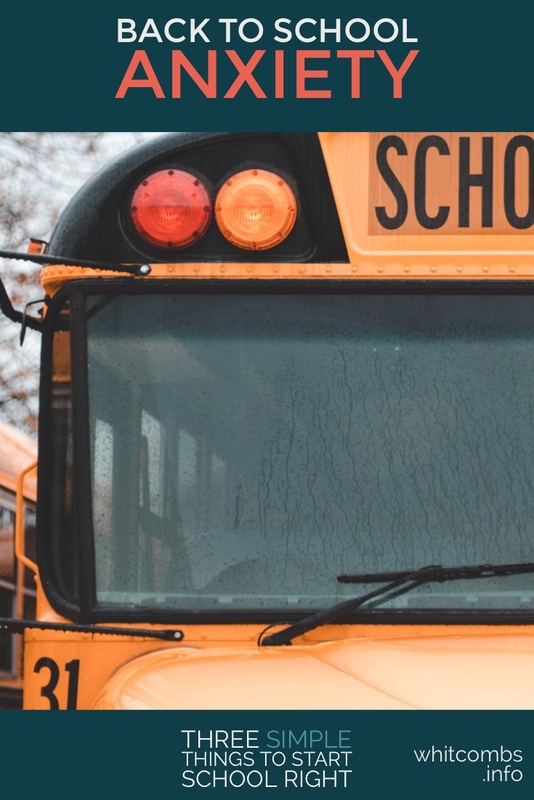 One of this year’s biggest stress points when we hit the beginning of the school year was the change from being driven to school to riding the bus to school. Our oldest definitely wasn’t into it. And we had our own doubts. So we took it outside our walls and asked someone with some experience. What we got was better help than we ever expected. One of his good friends had ridden the bus the year before, and he had nothing but good to say about it. This was the final push for our son to be okay with it. That expert advice was just what he needed. And it could never come from us. So when anxiety runs high, we know we have work to do. But that work doesn’t have to be as hard as we assume. Here are three things we do right away to help slow down the whole process. If your kid is feeling anxious, discuss that anxiety. What are they really worried about? What’s scaring them? How did that fear start? Getting an outside source of information is huge. It doesn’t have to be a “professional,” but it does need to be someone your kid can trust to be honest and up-front about their experiences. Get them talking together and you’ll see a change. Things don’t always go right. When that happens, be ready to shift gears and get things back on track. The hard-and-fast philosophy doesn’t work well with the high-strung, because it sets a permanent expectation on something outside of their control. Make it clear that changing course isn’t a big deal. Then act like that’s true, even if it freaks you out. Anxiety is no joke. Your kids are going to have it, just as much as you are, and sometimes more. If you’re aware of this very real possibility, you’re in better shape than many parents in this situation. Just keep loving them and letting them know you’re there to support them when things get rough or confusing. Having a steady hand through all the chaos is a key part of making things work.